Water-borne algal blooms from farm fertilizer runoff can destroy aquatic life and clog rivers and lakes, but scientists will report today that they are working on a way to clean up these environmental scourges and turn them into useful products. The algae could serve as a feedstock for biofuels, and the feedstock leftovers could be recycled back into farm soil nutrients. A multi-pronged nutrient bio-remediation system is the goal of a team of scientists who will present their research at the 249th National Meeting & Exposition of the American Chemical Society (ACS), the world's largest scientific society. The meeting, which takes place here through Thursday, features nearly 11,000 presentations on a wide range of science topics. "I grew up on a farm, and I know firsthand the needs of small-scale farmers, as well as the problems posed by algal blooms," says John B. Miller, Ph.D. "But I am also a chemist, so I see an upside with algae." Algae can range in size from a single cell to large seaweeds. They only need water, sunlight and a source of nutrients to grow. But with a boost from high levels of man-made nutrients—particularly nitrogen and phosphorus from farm runoff—the growth springs out of control. They form clumps called algal blooms that can be directly toxic to fish and other aquatic life. The blooms also can draw oxygen from the water, creating dead zones, where most life cannot exist. But Miller and his team at Western Michigan University envision a solution to problematic algal blooms, which can benefit small-scale farmers. Already, algae are gradually but increasingly being used as a feedstock for different classes of biofuels, including ethanol. It grows very quickly—some two to eight times faster than similar land-based ethanol feedstocks, such as corn, soybeans or cellulosic biomass—which is an advantage. Large-scale, centralized "algal turf scrubber" operations in Florida and elsewhere are getting underway and are growing natural communities of periphytic or attached algae for biofuel production. Miller is building on this approach but will downsize it to water bodies near small farms throughout the U.S.
"For small farm applications, the system must be easy to operate, nearly automatic and be suitable for diffuse installations," he says. "So, my focus has been to apply this technology without requiring the large infrastructure of the electric grid, large pumping installations and all the rest that is needed for centralized operations. A farmer won't have time to check an algae collection and processing system, so it has to also be able to operate remotely." Currently, the team is exploring different substrates to optimize algae growth in water bodies. By using 3-D printing technologies, the researchers engineer substrates to provide different geometric features that foster growth of algal blooms. They are testing these first in the laboratory before analyzing them out in the field. Also, they are investigating different options for collection techniques that will be more appropriate for small, remote locations. Miller points out that the algae can be used for biofuel feedstock, making a profit for the farmers. And the waste left over after the biofuel's fermentation and distillation steps is high in nutrients and carbohydrates, which is a material that can be recycled back to farm fields for use as an organic fertilizer. It may take a while to get the system up and running at farms, but Miller says that there is a powerful economic incentive for farmers to sign on. That's because it has the potential to shift problematic algae into biofuels, taking a farm-based ecological problem and turning it into a revenue stream for small-scale farmers, he says. More information: Coupling surface water remediation to sustainable energy: Toward off-grid production of algae for biofuels, 249th National Meeting & Exposition of the American Chemical Society (ACS). 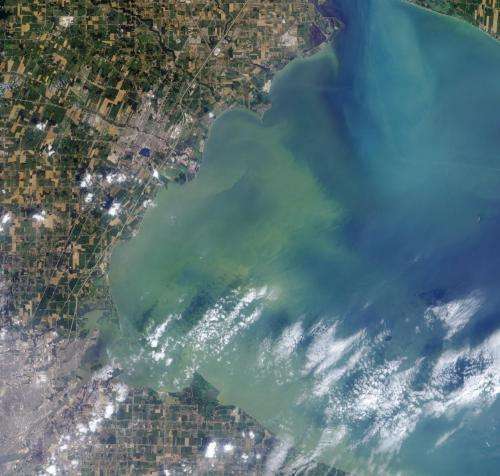 Excess nutrients from agricultural inputs have been implicated in large algal blooms in the Great Lakes and elsewhere, resulting in degraded water quality with subsequent consequences. Reduction of the nutrient load into large water bodies depends on reduction of nutrient outflows from surrounding drainage basins. Modern farming techniques reduce fertilizer application rates and limit the effects of major erosive events, but even small, adventitious excesses accumulate over an entire watershed. To reduce nutrient loads in surface waters beyond what conservation measures can achieve may require treatment. On a watershed scale, this can be accomplished by treating very large volumes with a few localized facilities, or treating small volumes with many distributed facilities. Nutrient scrubbers based on periphyton communities, so-called algal turfs, have proven to be an effective technique for absorbing nutrients from surface waters in several locations. The turf can be easily harvested, and the lignin-free carbohydrates in the turf used to produce fermented biofuels. The residual material left after fuel production contains the bulk of the nutrients absorbed by the algal turf, and is an effective fertilizer. This work examines the links between nutrient capture and bio-energy production using algal turfs, focusing on methods that are appropriate for distributed, small-scale installations. Particular attention is paid to concerns for remote or unattended operation in locations without access to a power grid. Algae are another Biofuel, a Renewable Energy Resource. Yes, Nitrogen & phosphorus from farm runoff make Algal growth to spring out of control. So also, Pet Food of Pet Industry & Scarce Fresh Water are letting Carnivores...from small to big, from adjacent to wild and from somewhat mild to very cruel ones to grow out of control. Continued: . What Ecology? World will NOT come to an end without Carnivores. We get Abundant amount of Herbivores. Earth did not Disappear along with Dinosaurs and Mammoths. Those ideas are illconceived fit for only olden days when we did not have guns, phones and planes; We are fighting ISIS. Same way, we can capture Resultant Oversupply of Herbivores, if any and use them for our own good in one way or the other. Pet Food Industry people should move onto Biofuel Industries & STEM for a change! That will be Transferring resources from useless animals to deprived humans. 3rd world nations were advised not to use firewood for cooking in the past decades when it was tough to get to crude oil resources; Compare it to Billions of acres of Forests gutted by FIRE in Stupid U.S right now year after year! You keep listening to Fools; Fools will continue to relentlessly Advise YOU! GO and get them grass man! Herbivores Do Love Grass! They are in Heaven soon because of Carnivores! Princess Di Comes to Mind.